Dedicated to raising participation in Fencing | So much more than just wielding a weapon! 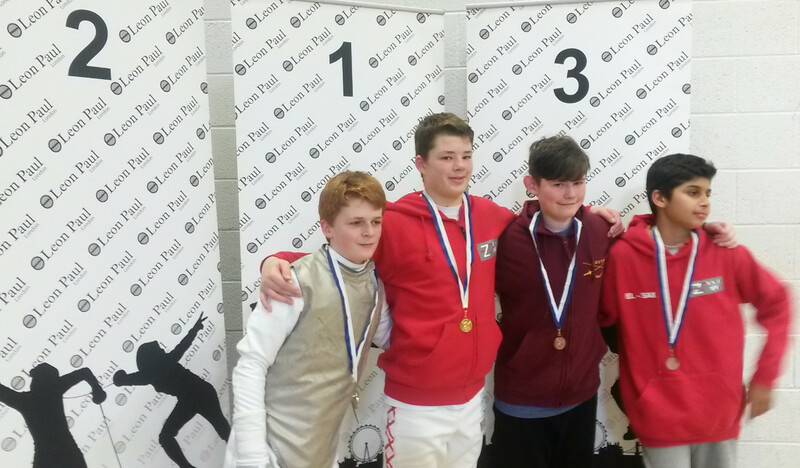 Nicholas Williams (left) wins another medal in LPJS U13 Boys Foil, 21/2/2016. Nicholas Williams has been the No.1 seeded fencer in the Leon Paul Junior Series Under 13 Boys Foil competition for the whole of the first half of the 2016 season. Nicholas has a Gold, two Silvers and a Bronze medal included in his current points tally of 103, which is 32 points ahead of his nearest rival and there are c.100 fencers in the ranking table. The current rankings can be found here. WELL DONE Nicholas an outstanding achievement and just deserts for all your hard work. This entry was posted in Competitions by Peter Ellinger. Bookmark the permalink.